I thought I’d jot down a few of the family stories my parents told me about their war-time experiences because they seem, to me, a little different to the image of the war years we are fed by more ‘official’ history. My grandad, George Price was born in 1900 and so was too young for the First War. At fourteen, he was already the wage-earner of the family. He left school and started work at 12 because his father, a miner, was out of work. He lived with his family in a row of cottages with slate roofs. Grandad at the brickyard. He's on the right. No idea who the other two are. At the time there was a tremendous scare about zeppelins, which were expected to float overhead at any moment, dropping explosives or incendaries. 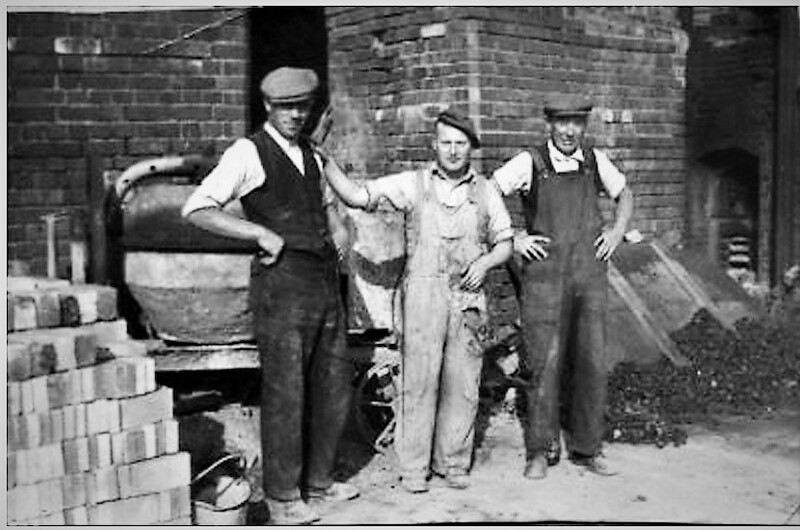 My youthful Grandad’s contribution to the war effort was to take the metal dustbin lids and shy them up onto the roofs. They landed on the slates with a terrific echoing clash and then slid and bounced down the slates making a din you can imagine. I’m told that when an elder of ‘the row’ found out that it was George Price who’d invented the prank, he was not surprised. “The brighter they am,” the elder observed, “the more ways they can think of to make trouble.” Grandad was also well-known for disturbing peaceful evenings by knocking on doors and politely asking what the time was. The factory at the end of the row had an enormous clock over its gate. 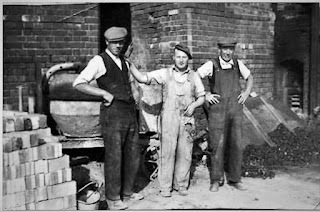 When I was told this story, I was always given the impression that the neighbours' fear of zeppelins was unfounded: that they were being rather silly and that the dustbin lids rattling down the slates was a great joke on them. I've since found that this wasn't the case at all. The neighbours had very good reason to fear zeppelins as the nearby towns of Wolverhampton and Walsall, about ten miles away, had very recently been bombed by zeppelins. It happened on January 31st, 1916 and the zeppelin L21 was heading for Liverpool but became disorientated. The crew were looking for the Manchester ship canal as a landmark and, thinking they were further north than they were, mistook one of the Black Country's many canals for the one they were searching for. The bombing killed 67 people and injured many more. This puts another complexion on my 16-year old grandad's little joke. I'm inclined to think he should have had a good hiding -- although as he'd been the family breadwinner for four years, nobody was going to do it. George Price grew up to marry Elsie Savage. I'm told they first met when his younger sisters invited her round. George (when not shying dustbin lids onto roofs) was a quiet man who liked to eat his meal and read his paper in silence. The girls were talking and laughing and annoying him. He told them to be quiet. Elsie stood up, put her hands on her hips and said something like, "You're not the boss of me, George Price!" He folded his newspaper, got up and threw them all out of the house. Since my Grandmother Price was anything but meek — ‘formidable’ is usually the word that people find themselves using to describe her — I can only conclude that she was in complete agreement with this. My aunt suspects, for various reasons, that there was sexual abuse in her mother’s family. There was certainly physical abuse. The refusal to send their children away to live with complete strangers may have been my Grandmother’s idea. 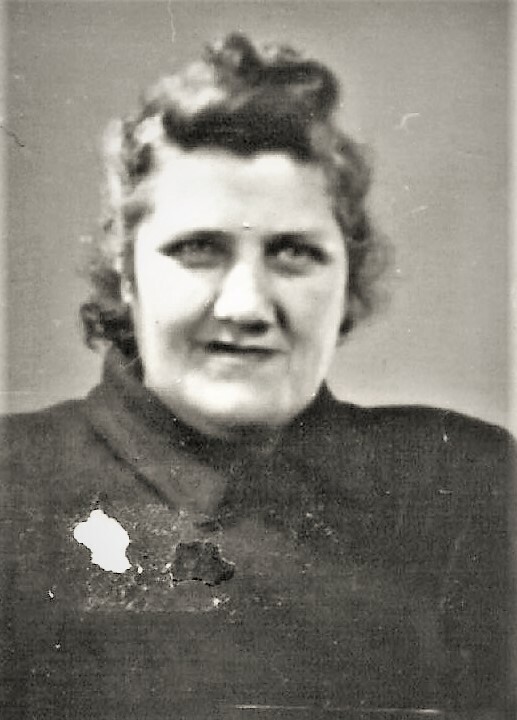 Elsie worked all her life -- in fact, she had quite a career, going from canteen worker to supervisor of School Meals for Oldbury (at a time when that meant cooking real meals in kitchens and coming up with a menu that supplied most of the daily nutritional requirements of a child.) She also became a Cordon Bleu cook and managed the VIP dining room at a company which entertained customers from all over the world. When the air-raid sirens sounded, Elsie was supposed to go into the works' shelter. Instead she went outside and ran through the streets to home, with shrapnel ricocheting off the walls and pavements as the anti-aircraft guns fired. She wanted to join her children in their own shelter. After she'd done this a few times, someone she worked with told my Grandad what she was doing and he told her, angrily, that she wasn't ever to do that again. What was her being missing from their shelter a few times compared to her being killed by shrapnel or a bomb and never coming home again? I suppose Elsie saw the point, as she started going into the works' shelter. I'll end with an alleged joke. This is an heirloom joke, worth one and sixpence, passed down to me through generations. A VIP, visiting A&P, stopped beside a workman and asked, "How many fighters do you make here in a week, my man?" "Oh, hundreds," the man said. "Hundreds, easy." "My word! You make hundreds of Spitfires a week?" "Spitfires? -- Oh, you said fighters. I thought you said, 'lighters'." Susan Price is the award winning writer of The Ghost Drum and The Sterkarm Handshake. Labels: Susan Price, World War 2. There are more coming up! -- I'm here all decade. |"at 14 he was already the wage-earner of the family" -- says it all really. Grannys form this time tended to be very solid and ran the home, my own Gran who passed in 1980 was the lynchpin of the family all my childhood! no one gainsaid Gran!